As Roman corruption and culture destroyed the social fabric of Jewish life, Judea revolted. But horrific in-fighting among Jews doomed the spirited rebellion. At the death of Agrippa I (Herod Agrippa) in 44 CE, the Jewish people were divided very sharply into warring factions: the Sicarii were the Jewish mafia, the Zealots, who were determined to drive Rome out of the country, a strong element of Helenized-Romanized Sadducees, the early Christians and, finally, the Pharisees (“Separatists”) who were the mainstream and represented the majority of Jews. 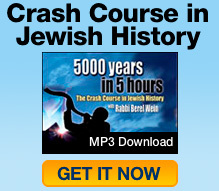 This period was probably the worst period in “internal” Jewish history. Even though there were great scholars and leaders who attempted to calm down the situation, the Jewish people literally destroyed themselves. That, indeed, is the message the Talmud wanted to convey when it said that the Temple was destroyed because of “baseless hatred,” i.e. hating someone for no reason. Agrippa I had died suddenly and somewhat mysteriously. He was succeeded by Agrippa II, who was a throwback to his great-grandfather, Herod, and who bore almost no resemblance to his pious, wise and good father. He was very intolerant of the rabbis, religion and the Jewish way of life. He had a vaulting ambition to Romanize the Jewish people. Because of this lethal combination he was immediately despised by most Jews. The patience, sympathy and support that the Jews had shown his father dissipated in the first year and a half of his reign. The only way he remained king of the Jews was at the point of the Roman legions’ swords. He became king while Claudius was emperor in Rome. Claudius was married to one of the wickedest women in the world, Agrippina. She had no compunctions about anything. Claudius was her third husband; it was a marriage of convenience. She had a child from one of her previous marriages, Nero, and was determined that he would inherit the throne after the death of Claudius. In time-honored Roman fashion, she set about eliminating all the competition. She had Claudius’ own children poisoned. After that, she had Claudius poisoned. The only measure of revenge exacted against her was that her son Nero eventually would have her assassinated. It is important to appreciate that the Roman world was a world of unsurpassed violence. It was a world where murder meant nothing. Human life counted for nothing. The accepted way to gain power was to kill one’s way into power. The accepted way to gain anything in the world was to take it. The Roman world was a world of violence, slavery, immorality and paganism. The only people that held fast to a different value system were that portion of the Jewish people that was loyal to Torah. Many times we despair of our world, but our world is almost a paradise in comparison to the Roman world. It started from the top down. Many of the Roman emperors suffered from mental disease (whether it was hereditary or it came with the job is a matter of debate). They were absolutely, stark-raving mad. Nero was among the maddest. His madness reached the crescendo of intentionally burning the city of Rome, killing thousands of inhabitants in the process, and while playing a fiddle. Forty years before the destruction of the Temple (30 CE, while Agrippa I still reigned), the Great Sanhedrin in Jerusalem had voluntarily withdrawn from trying criminal cases. The reason the Talmud ascribes to that move was because murder and violence had become too common. As the world of Judea began to look more and more Roman, the Sanhedrin retired. Thus began a change in role from a law-giving and administrative body into the great educational body of the Jewish people. The leader of the Sanhedrin at that time was the son of Hillel, Shimon. He led for about 15 years. When he died his son, Hillel’s grandson, became the head of the Sanhedrin: Rabban Gamaliel, often referred to “Rabban Gamaliel the Elder” to distinguish him from the Rabban Gamaliel who lived a couple of generations later. Rabban Gamaliel the Elder authored many decrees in the Talmud under the heading, tikkun olam, i.e. in order to preserve the world, strengthen society and make it more just. These decrees have to be understood against the background of everything else that was happening. The world in general, and the Roman world in particular, was falling apart. God allows extremes to exist as the same time. At one extreme, the general world was without morality and destroying itself. At the other extreme was the “little Jew” trying to make life more honest, fair and to give the lower class an even chance. In history it was Rabban Gamaliel who prevailed. If there is a recurring theme in this period it is that the losers always win; historically, the weaker group, so to speak, somehow outlasts the stronger. Under Agrippa II, the Romans sent in military governors. One of the most hated and cruel was Pontius Pilate. He is mentioned in the Christian Gospels as well as the Midrash. Like other Romans, he was a person of no moral character. He was so terrible that the Jews not only hated him but were ready to revolt rather than continue under him. When he was finally removed about 50-55 CE there were a string of Roman governors one worse than the next. They literally squeezed the life out of the economy of Judea, providing no public services in exchange, allowing the mafia to go unchecked, until there was almost no hope for any sort of life. A stream of Jewish emigration began. Jews went to Rome, Alexandria, Babylon and anywhere in the world but Judea. The Roman historians wrote (not in a positive context) that there was no place in the Roman Empire where Jews could not be found. With this spread of Jews throughout the Roman Empire arrived the first waves of organized anti-Semitism. The main spokesman was a Greek living in Alexandria called Apion. He wrote a book that would have made Nazi propagandist Julius Streicher proud. He wrote that Jews drink the blood of non-Jews; that it was a commandment for Jews to cheat non-Jews, etc. – all of the classic canards and libels. The famous Roman orator Cicero was another terrible anti-Semite. In short, it became fashionable in the Roman Empire to be anti-Jewish. We cannot expect to completely eliminate anti-Semitism, but in certain societies it is not fashionable, so to speak, to hate Jews publicly. However, when it becomes fashionable and perfectly allowable to state it publicly, then troubles for the Jews are not far behind. Apion’s books and speeches stoked the fire of civil war between Jews and non-Jews in Alexandria, a civil war that would continue on and off for the next century until the Jewish community there would be finally destroyed. Later, Josephus wrote a book called, Contra Apion (“Against Apion”), which debunked the claims of Apion and made a great impression on the populace at large. It served as a stirring defense against the anti-Semitic canards promulgated by Jew-haters of all stripes. Nevertheless, a cauldron of boiling hatred created a terrible climate for Jews wherever they were. When Rabban Gamaliel the Elder died he was succeeded by his son, Rabbi Shimon ben Gamaliel, who appears numerous times in the Talmud. However, there are at least four, if not five Rabbi Shimon ben Gamaliels. Again, our story now is mainly concerned with the first two. Rabbi Shimon ben Gamaliel attempted to prevent the debacle that was about to happen by telling the Zealots that they could not win the war. Apparently, the rabbis had a tradition, as well as an intuition, that the Temple would be destroyed and the Jewish people put into exile. Therefore, they tried every way to prevent it from happening, to come to an accommodation with the Romans somehow. Together with him as leader of the Pharisees was Rabbi Yochanan ben Zakkai (Johanan ben Zakkai). The Talmud reports that he was the youngest and least of Hillel’s 80 main disciples. He would be the one man who would save the Jewish people in its hour of destruction. When the war began Rabbi Shimon ben Gamaliel and his son went into hiding, because they knew that the first thing the Romans would do would be to execute the family of the leaders. That is why they were not publicly active during this period of time. Consequently, the leadership of the Sanhedrin fell upon Rabban Yochanan ben Zakkai. He is the one who would miraculously deliver the Jewish people from the jaws of extinction. The war began in the Galilee. The Jewish rebellion was very successful initially. General of the Jewish army in the Galilee was a man named Yosef ben Mattityahu HaKohen, known in later history as the historian Josephus Flavius (his Roman name). He and the Sicarii leader Johanan Gush Halav freed the entire Galilee of all Roman legions. We have victory coins from the time that describe a measure of the success of the Jewish armies in those two years. However, in 66 CE the Romans sent their leading general, Vespasian, together with an additional three legions to Judea. Vespasian brought his son Titus with him as the commander of the Tenth Legion, the most famous – or, rather, infamous – legion in the entire Roman military. The tide of battle swung back to the Romans. They besieged the Galilee city by city, destroying the local militia, slaughtering civilians and burning to the ground whatever remained. They gave no quarter and showed no mercy. Finally, the Romans surrounded Josephus himself. After destroying all the fortifications there were only 40 people left alive. As told by Josephus, the 40 agreed to commit suicide rather than fall into Roman hands. Josephus arranged it that he would be the fortieth. When the other 39 had taken their lives he surrendered to the Romans. He ingratiated himself with Vespasian. That is where the debate begins whether or not he was a hero for the Jewish people, who saw the futility and tried to mitigate their losses, or whether he was a traitor. Either way, for the rest of the war – from 66 to 70 CE – he was literally in the Roman camp. Later he would move to Rome and become an honorary citizen, holding positions of importance and honor, authoring his famous books, especially the Antiquities of the Jews, which was a history of the Jewish people from the exodus of Egypt until the destruction of the Second Temple, and The War of the Jews, which deals in great detail from the time of the Hasmoneans until the destruction of the Second Temple, focusing on the war between Rome and Judea. Vespasian ground out the war, city by city, village by village, death by death. By 68 CE he had come to the walls of the city of Jerusalem, which had been prepared to withstand 20 years of siege. Nevertheless, the internecine warfare among Jews destroyed whatever chance they had to hold out. The Zealots fought against the Sicarii for control of the city. Remnants of Agrippa’s army controlled other parts of the city. All three fought each other, killing thousands of people. To top it all off, Johanan Gush Halav invaded the city through the Roman lines and fought a pitched battle with the forces of the Zealots. In order to make certain that the Jews would fight to the last man the Zealots burned all of the supplies that had been stored up. They felt that the Jews would not be aggressive enough – desperate enough – to defeat the Romans if they knew they could hold out for a long time. By burning the storehouses of supplies, the Zealots guaranteed the destruction of millions of people. Jerusalem was now under siege from without and from within. The Romans brought up all the modern inventions of war even as disease and famine ravaged the population inside the city. The Talmud shares some of the horrendous stories, including cannibalism. People lost their humanity. It was arguably the worst time in Jewish history, representing the complete destruction of the very fiber of the Jewish people. As the city was literally going up in smoke, Rabbi Yochanan ben Zakkai took upon himself to undertake a daring and dramatic act to not only salvage the remnant but insure Jewish survival long into the dark night of the next 2,000 years of exile.